Supermoons are the phenomena where a full or new moon occurs at the point of perigee (closest to Earth), making the Moon appear fuller in the sky. Click the image at right to enlarge. Also called perigee-syzygy (“close align”), supermoons are regarded as more powerful lunations and will correspond with increased volatility in human affairs, weather patterns, and earth changes such as volcanoes or earthquakes. There are also lunations that occur at the point of furthest from the earth (apogee), called micro moons. 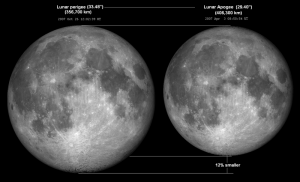 This is where the Moon will be seen as smaller than usual, with potentially of unique effects also. Technically a micro moon would be called apogee-szyygy. Times listed are in GMT, adjust for your time zone.